This changes things a little bit. He did not in an off the cuff manner say “oh yeah, we’re all going to heaven.” In the context of the eschatological mystery, the unveiling of the new Jerusalem, where we are one with God, he adds “all of us” (Tutti noi), will be up there, and he finds the need to add everyone “tutti” again. While on the one hand, statements the Pope has made in his pontificate might lend one to believe he means this as in each and everyone, it is not absolutely clear that this is his intention in the general audience. It could just as easily cut the other way, since the full context is the New Jerusalem, and the people he is speaking to are Christian pilgrims, not the EU parliament; one could equally argue, based on the context, that presumably the Pope meant that all of us here, provided we live a good life, will meet in heaven. That perhaps is being too generous to the Pope, as he did not make that qualification. Maybe not, and anyone who knows me knows I have little love for this pontificate, nevertheless, we can’t really be sure. It just seems contrary to reason that the same Pope who has talked about Christians going to hell (he usually means Trads of course) would say that without the meaning of at least if they do good works implicitly in mind. On the other hand, he could have used the subjunctive: “troveremmo” we may, or a nuance with trovassimo, but instead he used the future indicative. This one leaves too much room for doubt. Salvation does not begin with the confession of the kingship of Christ, but the imitation of the works of mercy, the means by which He has realized the Kingdom. Those who have taken the steps to show that they have accepted the kingship of Jesus, have done so because they have made room in their heart for the love of God. In the evening of life we shall be judged on love, on the closeness and tenderness toward our brothers. From this our entrance into the kingdom of God will depend or not, our position on either side. Jesus, with his victory, opened his rule, but it is up to each of us to enter, starting from this life, making us concretely next to his brother asking for bread, dress, hospitality, solidarity. And if you really will love that brother or sister, we will be compelled to share with him or her what is most precious, that Jesus and his Gospel!2 (Source, My emphasis). This is a statement loaded with problems. On the surface it looks like a mere nicety, feed the hungry, clothe the needy, take care of the sick, etc. Yet the very first verb sets the tenor of the discussion. “Salvation does not begin with the confession of the kingship of Christ.” What does that mean? Ultimately, it boils down to faith. We are saved by faith, not faith alone, but works done with faith. This means that, faith is not sufficient by itself, because it is not real if it doesn’t have works of charity to prove it. It also means the converse, that works have to be done with faith in order to get to heaven, or else they are simply works of the law, as St. Paul says. Wherever one nature is subordinate to another, we find that two things concur towards the perfection of the lower nature, one of which is in respect of that nature’s proper movement, while the other is in respect of the movement of the higher nature. Thus water by its proper movement moves towards the centre (of the earth), while according to the movement of the moon, it moves round the centre by ebb and flow. On like manner the planets have their proper movements from west to east, while in accordance with the movement of the first heaven, they have a movement from east to west. Now the created rational nature alone is immediately subordinate to God, since other creatures do not attain to the universal, but only to something particular, while they partake of the Divine goodness either in “being” only, as inanimate things, or also in “living,” and in “knowing singulars,” as plants and animals; whereas the rational nature, in as much as it apprehends the universal notion of good and being, is immediately related to the universal principle of being. Thus, what St. Thomas is saying one cannot truly love his brother (love of neighbor for God’s sake), unless he has faith, because faith is what orients his actions toward God, and allows him to show the love of God. Faith is what allows a man to strive for God, and, moreover, we do not cause faith, God causes faith in us. We do not make it with our works. It is particularly telling, when Francis, who comes straight out of a liberation theology tradition, and sets up his home at “St. Martha’s”, even though Christ Himself said Mary had the better part, should now focus on works without faith. In fact, if we look at what he is saying, he is ultimately teaching a form of Pelagianism. To be fair, Pelagianism and its forms taught that one could perfect his nature of his own without God’s assistance. The Pelagians would not have questioned that one needed faith in some sense, just not as an absolute to attain salvation. There is a particular irony that Francis should teach this, when, he has called Trads “Pelagians”, based on the fact that Pelagius is supposed to have been very austere. (Would that trads would be more austere!) Yet here he is teaching something close to the doctrines of Pelagius. Such contradictions are not new for Francis, who one day says “Don’t be too obsessed about yourself” (which is perfectly correct) and then the next day commissioned a biography of himself (which is perfectly contradictory). But hey, God is a God of surprises! Needless to say, on this one, there is no translation error. Miserere nobis Domine! Remember to pray, we get the leaders we deserve. 1. La Costituzione conciliare Gaudium et spes, di fronte a questi interrogativi che risuonano da sempre nel cuore dell’uomo, afferma: «Ignoriamo il tempo in cui avranno fine la terra e l’umanità, e non sappiamo il modo in cui sarà trasformato l’universo. Passa certamente l’aspetto di questo mondo, deformato dal peccato. Sappiamo, però, dalla Rivelazione che Dio prepara una nuova abitazione e una terra nuova, in cui abita la giustizia, e la cui felicità sazierà sovrabbondantemente tutti i desideri di pace che salgono nel cuore degli uomini» (n. 39). Ecco la meta a cui tende la Chiesa: è, come dice la Bibbia, la «Gerusalemme nuova», il «Paradiso». Più che di un luogo, si tratta di uno “stato” dell’anima in cui le nostre attese più profonde saranno compiute in modo sovrabbondante e il nostro essere, come creature e come figli di Dio, giungerà alla piena maturazione. Saremo finalmente rivestiti della gioia, della pace e dell’amore di Dio in modo completo, senza più alcun limite, e saremo faccia a faccia con Lui! (cfr 1Cor 13,12). E’ bello pensare questo, pensare al Cielo. Tutti noi ci troveremo lassù, tutti. E’ bello, dà forza all’anima. 2. La salvezza non comincia dalla confessione della regalità di Cristo, ma dall’imitazione delle opere di misericordia mediante le quali Lui ha realizzato il Regno. Chi le compie dimostra di avere accolto la regalità di Gesù, perché ha fatto spazio nel suo cuore alla carità di Dio. Alla sera della vita saremo giudicati sull’amore, sulla prossimità e sulla tenerezza verso i fratelli. Da questo dipenderà il nostro ingresso o meno nel regno di Dio, la nostra collocazione dall’una o dall’altra parte. Gesù, con la sua vittoria, ci ha aperto il suo regno, ma sta a ciascuno di noi entrarvi, già a partire da questa vita, facendoci concretamente prossimo al fratello che chiede pane, vestito, accoglienza, solidarietà. E se veramente ameremo quel fratello o quella sorella, saremo spinti a condividere con lui o con lei ciò che abbiamo di più prezioso, cioè Gesù stesso e il suo Vangelo! 3. χωρὶς δὲ πίστεως ἀδύνατον εὐαρεστῆσαι, πιστεῦσαι γὰρ δεῖ τὸν προσερχόμενον τῷ θεῷ ὅτι ἔστιν. Hebrews XI:6. 4. II Q.2, a.3 respondeo. (NB: due to time constraints, I departed from my normal custom of using my own rather than someone else’s translation of St. Thomas. As a rule I only use the Latin, but when its online and your busy, its just too easy). In re: What Did Pope Francis really say? This is difficult for me to say. I, in general, love your website and appreciate reading your meditations. Looking out over the Church and considering the various factions, I recognize a personal affinity for tradition. Unfortunately, your exegesis, or rather eisegesis, of Pope Francis’s homily for the Feast of Christ the King, reminds me more of Protestant ‘proof-texting’, than it does a faithful piece of exegesis of sacred Scripture by St. Augustine or St. Thomas Aquinas (e. g. Enn. Psalms, or Catena Aurea). It is rationalism, plain and simple. “For thus says the Lord GOD: Look! I myself will search for my sheep and examine them. As a shepherd examines his flock while he himself is among his scattered sheep, so will I examine my sheep. I will deliver them from every place where they were scattered on the day of dark clouds. as well as evoking Jesus’s eschatological reference to the ‘dies irae’ (cf. “I will judge between one sheep and another, between rams and goats” to Matt. 25: 31-46, particularly verses 31-33). The rest of that second paragraph (“how Jesus brought about the kingdom”) is tailor made to evoke faith by focusing on the Person and Work of our Savior and Lord Jesus Christ (“which show the care and love the Shepherd has for His flock: to search, to look over,…All of these are fulfilled in Jesus Christ). It is not until the fifth paragraph that the Pope begins to develop “what Jesus’ kingdom requires of us” (charity in the form of good works) and begins to broach the subject of what you call Pelagianism (“In fact, if we look at what he is saying, he is ultimately teaching a form of Pelagianism”). This is pathetically shoddy work given traditionalists meticulous penchant for making tight arguments with a major premise, a minor premise and fortifying evidence from divine revelation, papal encyclicals, doctors of the Church (particularly St. Augustine and St. Thomas Aquinas), and other saints of the Church. In fact you quote St. Thomas but in a blatantly hackneyed manner that is reminiscent of the way Protestants will inappropriately ‘proof-text’ their theology with notoriously inappropriate pericopes (Can you please explain how the quote from St. Thomas somehow proves faith is first and works are done in charity; in other words how St. Thomas’s pericope refutes Pelagianism?). and refutes your subjective take on the Pope’s homily (in the title, “Francis” – are the two of you on a first name basis? It is the mark of one’s ‘noblesse oblige’ that one treats both one’s interlocutors, disputatious opponents, and one’s enemies with the same dignified comportment and decorum, that one treats one’s family, friends, and brothers in arms), presented as an objective assessment, by ignoring those aspects of the homily that refute your assertion. Honestly, this borders on the calumnious. I am sorry to say you have lost me as a brother in arms, if this is what opposing the Pope is all about. Paying for a blog site does not qualify one as a trained theologian or exegete. Nor does dressing the margins with homages / holy statues to St. Athanasius, Hillaire Belloc, G. K. Chesterton, Cardinal Ottaviani or St. Augustine of Hippo make of one a ‘traditionalist’. It is not the accidents, but rather the substance or form that is the “unum necessarium”. I’m sorry to say that I think you have completely missed the point, though I appreciate the spirit in which you wish to correct what you perceive a wrong. Major premise: Faith is necessary unto salvation, without which we cannot please God, the beginning of salvation, and is given to us by God from no merit (works) on our own part. Minor premise: Pope Francis, in his sermon, said that works are the beginning of salvation, not faith. Conconsequent: Francis argues faith is not necessary to salvation, which is akin to certain forms of Pelagianism. Moreover, it doesn’t follow that because someone does the works “of Jesus’ Mercy”, that he actually has the virtue of charity. Just as importantly, you claim I have taken him out of context. I would submit to you the entire document is nothing but a seamless garment of what he says in the 6th (not 4th) paragraph (unless the English is paragraphed differently from the Italian. I read Francis’ homily in the original Italian, and he makes no reference to faith anywhere in the document. Paragraph one: Introduction to express what the liturgy says, more importantly, “What Christ asks of us now.” Paragraph 2: Indeed affirms Jesus founded a kingdom (did I ever say anywhere that the Pope denied this?) and Jesus did works, (follows on the hinge of what he is asking us now in par. 1). Paragraph 3: Shepherds are called to follow this example (again works); paragraph 4: Jesus’ kingdom is not to command but to love and offer, again fits the theme of what we are called to do from paragraph 1, love our neighbor (but no reference that we love our neighbor for God’s sake, not his own); Paragraph 5: Francis again sets up the primacy of works, and with a scripture quote, fulfilling the theme introduced in the first paragraph of what is expected of us, then brings it to the conclusion in paragraph 6, which is as I said. In fact, if anyone is doing Eisegesis, it is Francis, for the passage immediately before the one in dispute (paragraph 5), sets up a proof text for his position that the starting point of salvation is works not faith, by singling out the very thing by which we’re judged: works, which is out of the context of the Gospel. I don’t see where you see a contradiction between my analysis and the foregoing paragraphs of his homily, which I linked in the original. That he talks about what Jesus did, and other things doesn’t show that he believe individuals need faith for salvation. It does show he thinks they need works. However, if none of that is good enough, I call to witness Francis’ own words on another occasion to show he doesn’t seem to understand the virtue of faith. The Holy office would have jumped all over this one. The reason is propositions are taken in individual statements, irrespective of whether the context would actually make it somewhat orthodox. So, if we look at this one, how does it look in the light of tradition? So, firstly, if someone does not do meritorious works, that is works of faith as opposed to works of the law, it is true he will not be saved. But it is not true that while he is in this life that he has no faith (loses the faith). For, failing to do good works would be a sin. But it doesn’t follow he has no faith. There is no scriptural basis for that. Rather, as St. James says (James II:26), it is dead faith. This is not a distinction without a difference. The reason the Council of Trent anathematizes this, is because the consequent that one who doesn’t do good works (sins) has no faith, is that whenever a Christian sins he loses the faith. If that were the case, then the visibility of the Church would be lost. Did he misspeak? Maybe, but that would be misspeak number 5,000 for this pontificate. As to St. Thomas’ quote, it is to clarify the nature of faith. Read it again. (Though I must say, I haven’t seen the word “pericope” in ages. St. Thomas clearly says at the end: “Hence in order that a man arrive at the perfect vision of heavenly happiness, he must first of all believe God, as a disciple believes the master who is teaching him.” Did you miss the clear contradiction between St. Thomas’ words and the Popes? Or for that matter, the clear contradiction between the infallible teaching of Trent in the Canon and Francis’ teaching in the quote I provided? I’m sorry we have to come to such sharp disagreement, but I suggest you look over all this again. It is the mark of one’s ‘noblesse oblige’ that one treats both one’s interlocutors, disputatious opponents, and one’s enemies with the same dignified comportment and decorum, that one treats one’s family, friends, and brothers in arms), presented as an objective assessment, by ignoring those aspects of the homily that refute your assertion. If just that much gets you worked up, I wonder that any website could please you. I’m sorry we can’t find agreement here. I have to say that the wrong translation theory is extremely offensive. It is really somewhat libelous since a whole trade is being portrayed as absolutely incompetent. Having worked in a translation agency I can say that extreme blunders are rather rare among professionals. Yet, those who translate for important people like the Pope seem to make serious mistakes almost daily? Without any consecuences? I’d expect such a translator to get the boot pretty soon. And where are the corrections from the Holy See Press Office if the Pope’s statements contained doctrinal errors added in the translation process? This is what I thought under Pope Benedict. There are translation errors that are made, and everyone will make them from time to time, as you know and as I have certainly done, but no office in history responsible for translation has ever made that many bad translations and still kept their job, as you say. Albeit it comes down to ecclesiastical patronage in many cases, so it is possible a bunch of men who are really periti imperitiae might inhabit the office. Modern Popes have not discharged their duties to teach the truth and condemn error and as a consequence the voice and judgment of Christ has been silenced in this world. Further, the modern papal praxis has led to out Inertia Into Indifferentism and invisibilium within the Holy See is that Prelate who possesses Tradition to such an extent that it could be used as a force against that inertia. Pity the poor ultramontane trying to explain away virtually everything Our Pope and Our Cross says and does. Can you do a translation of Francis’ comments in the same speech that “no nation has the right to unilaterally resist an unjust aggressor.” I have seen various translations of this comment…if the above is the correct translation, it is extraordinarily errant. When did he give that one? It will help me find it. That is either a big translation error, or a big papal gaffe. There should be a bulletin about them on the Vatican website. I know which one you’re referring to, and I actually agreed with part of it, namely that NATO is basically state terror through the collateral damage it reaps throughout the middle east. Nevertheless, the bit about unilateral consensus is hugely flawed morally. That is a post in itself. Io mai do per persa una cosa, mai. Forse non si può avere un dialogo, ma mai chiudere una porta. E’ difficile, puoi dire ‘quasi impossibile’, ma la porta sempre aperta. Lei ha usato due volte la parola ‘minaccia’: è vero, il terrorismo è una realtà che minaccia… Ma la schiavitù è una realtà inserita nel tessuto sociale di oggi, ma da tempo! Il lavoro schiavo, la tratta delle persone, il commercio dei bambini… è un dramma! Non chiudiamo gli occhi davanti a questo! La schiavitù, oggi, è una realtà, lo sfruttamento delle persone… E poi c’è la minaccia di questi terroristi. Ma anche un’altra minaccia, ed è il terrorismo di Stato. Quando le cose salgono, salgono, salgono e ogni Stato per conto suo si sente di avere il diritto di massacrare i terroristi, e con i terroristi cadono tanti che sono innocenti. E questa è un’anarchia di alto livello che è molto pericolosa. Con il terrorismo si deve lottare, ma ripeto quello che ho detto nel viaggio precedente: quando si deve fermare l’aggressore ingiusto, si deve fare con il consenso internazionale. Rorate Caeli’s translation was exactly right, and I don’t think I could improve upon it. The emphasis I put, “si deve fare con il consenso internazionale”, or, “it ought to be done with an international consensus” is a HUGE problem. He is basically saying that a moral decision, subject to the Church’s judgment, should instead be decided by the “international community.” That International consensus is of course made up of secular governments run on masonic principles of man (irrespective of any active influence of Freemasonry, that is a different issue), operate according to profit and economic interest. If we consider wars of the “international community”, Iraq (1991) Serbia, Afghanistan, Iraq (2003), these were war crimes. They involved the very thing he condemns (correctly in my view) as state terrorism. Is it suddenly okay because the international community said so? Francis appears to be saying yes. It is another of many contradictions of this deeply contradictory pontiff. 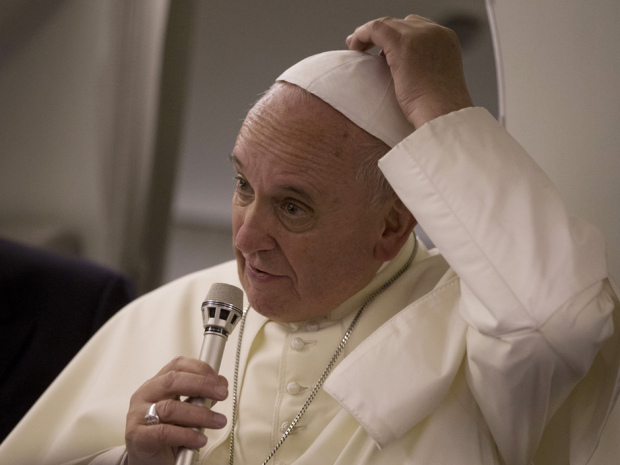 Pope Francis, “who comes straight out of a liberation theology tradition”? I’m sorry, but this is simply not accurate. I would be interested to know how you come to this conclusion. Have you done the research or are you just repeating something you’ve heard?